While there have been a few hiccups along the way, the Cleveland Cavaliers have been coasting through the start of this NBA season, with LeBron James and Kevin Love turning into quite the productive duo, playing some fantastic basketball along the way and slowly building themselves a healthy lead in the East. 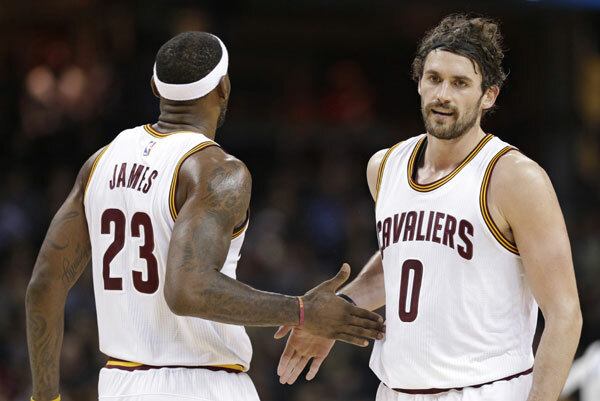 The Cavaliers improved to 8-0 this season at home and 11-3 overall at the expense of the Orlando Magic, winning 117-103. The game was close for about two quarters before James turned up his passing and game managing skills, while the defense played it’s part. The Cavaliers are missing the backups to the players that are already out in some cases, but it hasn’t stopped them from doing their job and winning the games they’re supposed to, sometimes a lot more easily than is should be. It might say something about the weakness of the East, as the Magic, who have been building towards a playoff challenge for the last three seasons, are struggling to put on together, currently stumbling to a 6-8 record without any consistency on both ends of the floor from their young, talented but reckless players. The backcourt of the future that includes Elfrid Payton and Victor Oladipo had just 10 points in the game, with Payton held to 0 in 19 minutes. Meanwhile, Kevin Love scored 34 points, a new high for him as a Cavaliers player, hitting six three pointers and shooting 11-of-18 from the field. J.R. Smith scored 26 points and played a big part in the three-point barrage (18 3’s in all) and Matthew Dellavedova scored 15 points to go with 9 assists. LeBron James? He made it look easy most of the time, finishing with just 15 points (averaging 25.8 this season) with 6 rebounds and 13 assists, including a few that he might be the only one in the league capable of pulling off. Until we see the full-forced Cavs, and that might be a while of waiting, we won’t know just how good they are. But when trying to compare this to last season and the struggles of putting a new team together, things are running smoothly, even when James isn’t carrying all of the load on his back. Love is much more comfortable with his role, the offseason problems of Tristan Thompson and Smith aren’t getting in the way, and David Blatt, with or without power over his players, is free of the pressures that plagued him during the early days of his tenure, leading to much better basketball and much better results.